Blue and white palace design on Sauce Boat with a pedestal base. Table Wares are popularly used to place the on the table to store products like tissue paper, spoon, menu, sauces, salt & pepper. These are highly preferred by hotels and restaurants as it is highly suitable to make the table attractive. We offer high quality of sauce boat. 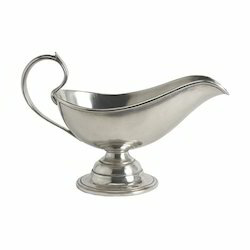 We Offer A Variety Of Shapes And Designs For Sauce Boats In Silverplated With Antique Finish. This set contains 1 pc. Height: 82, 5 mm. 3 1/4 ".Top Diameter: 125 mm. 5 ".Bottom Diameter: 61 mm. 2 1/2 ". Flexible dishes for handling liquids or solids. Ideal for controlled pour-off. These Anti-Static Weighing boats with contoured sides provide a convenient non-slip gripping surface. As well, they allow for more accurate weighing and reading of a sample. The canoe shape enables pouring of weighed samples.